Planets best super fan ! – WhatZupBristol! In Stephen Laughton’s One Jewish Boy, the impact of religion in a mixed relationship is shown in all its messy reality. For Jewish, Highgate-born Jesse, the past atrocities of the Holocaust weigh heavily on him, and he sees anti-semitism in every element of his and his girlfriend’s life. Alex, mixed-race and from Peckham, displays sheer desperation at Jesse’s obsession with his relatives’ inherited trauma. This preoccupation threatens to break up their relationship at multiple points. 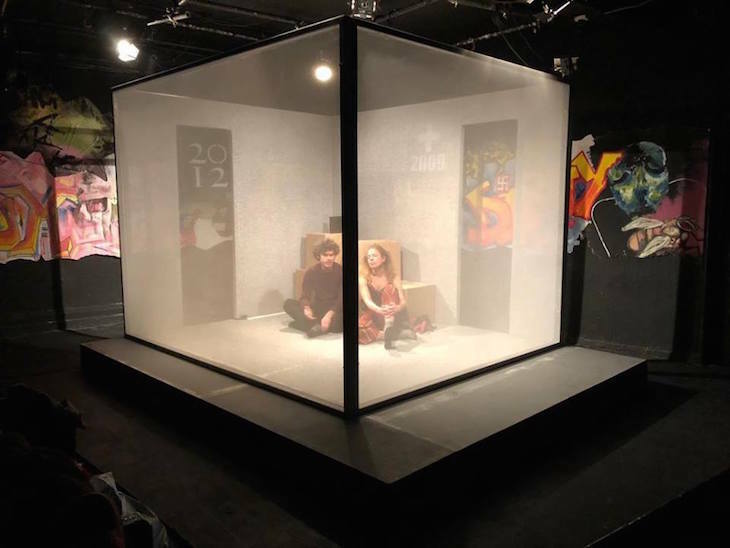 The drama all plays out inside a clear-walled box (representing Jesse and his girlfriend Alex’s various flats over the years) as well as on a ledge outside the box, which stands for the outer world, with its potential dangers. Chronologically, the drama hops all over the place, beginning in the present and (in no obvious order) stopping at various points in the past, all the way from their first meeting until the point in 2018 where divorce papers are being tossed about. Lit neon signs which illuminate at various scene changes, acting as a calendar, are the only way the audience knows which year we’re in. It’s not an overstatement to say that a good 85% of the drama is an argument of some kind between Jesse and Alex. It feels rather repetitive and slightly circular, and at points it is unclear just how all this bickering is relevant, or where it will go. The free-flowing nature of the speech could easily fool you into thinking you were watching a real relationship breaking down, or playing witness to a soap opera that had jumped out of a TV. 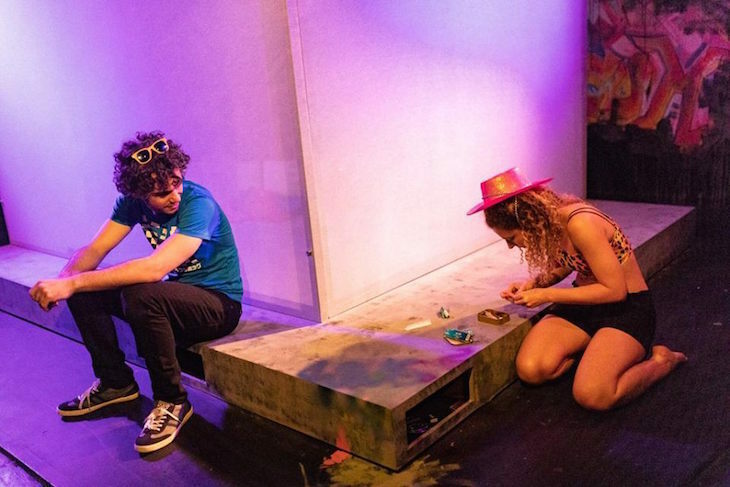 The acting is so believable and Robert Neumark-Jones and Asha Reid utterly convince the audience that they really are Jesse and Alex. An emotionally driven insight into the way religion seeps into each part of life, One Jewish Boy is a topical and gripping drama that shows only the tip of the iceberg. 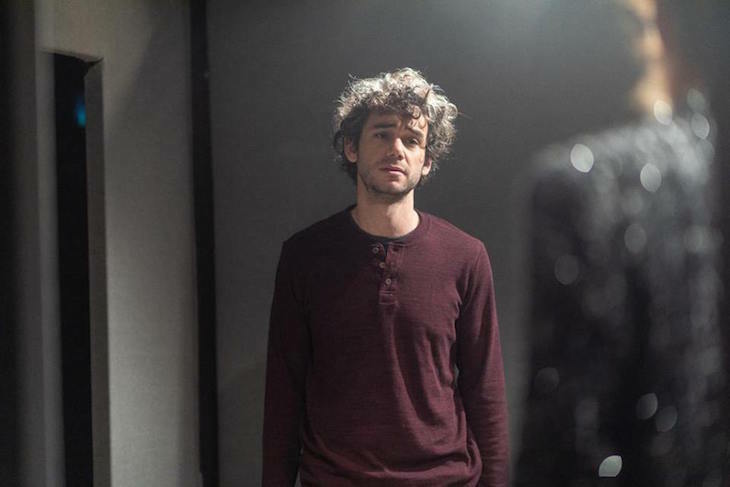 One Jewish Boy, Old Red Lion Theatre, 418 St John Street, London, EC1V 4NJ. Tickets from £15.50, until 5 January 2019.